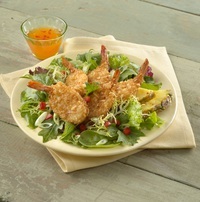 Premium, P&D, tail-on shrimp are water-glazed and quick-frozen to capture the firm, delicious texture and taste of freshly harvested shrimp. Add your own special marinade or sauce for an exclusive flavor profile. To Grill, Bake or Broil, cook on each side approximately 1-2 minutes from a thawed state or 3-4 minutes from a frozen state (depending on cooking temperature) or until core temperature reaches 165°F. DO NOT OVERCOOK. 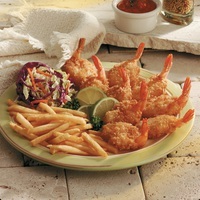 OCEANWAY® DINNER SHRIMP 16/20 CT.